Gunmen seized a United Nations official in Mogadishu on Thursday in the first kidnapping of a U.N. staff member in war-torn Somalia for a year, officials from the world body said. The kidnapping of a Somali worker with the U.N. children's agency UNICEF occurred a day after U.N. Secretary General Kofi Annan presented a report saying Somalia remained too dangerous to open a U.N. office in the capital. Six militiamen in a Land Cruiser car kidnapped the worker in the early morning, said an official working with UNICEF in Mogadishu who declined to be identified. The official said his colleague was taken hostage by a man demanding that UNICEF reinstate a canceled car rental contract he had held with them or pay a ransom. The kidnap followed the Friday killing of a 70-year-old Swiss woman who had worked for a humanitarian agency in southern Somalia and several days of clashes in Mogadishu that killed at least 27 people. 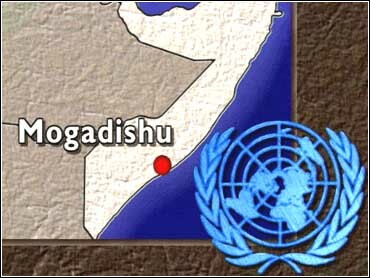 Somali gunmen kidnapped nine Westerners and a Somali aid worker in March 2001 after an attack by militiamen loyal to warlord Muse Sudi Yalahow on the Mogadishu compound of the medical charity Doctors Without Borders. Somalia has been in the grip of rival warlords since it descended into chaos after the ousting of former dictator Mohammed Siad Barre in 1991. For most of the past eight years no expatriate U.N. staff have been based in the capital Mogadishu, generally considered to be the most dangerous part of the country, although they have occasionally visited the city for short periods.